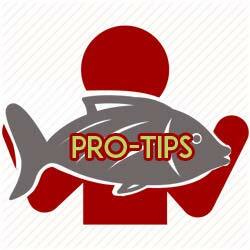 In sportfishing circles pretty well everywhere, fishing in Costa Rica is a frequent topic. 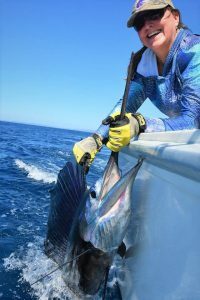 Costa Rica is a world-class fishing destination that has it all: first, an abundance of offshore and inshore gamefish on both its Pacific and Caribbean coasts. 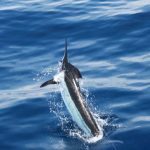 On the Pacific side, you can count on marlin and sailfish, yellowfin tuna and dorado 365 days a year, with seasonal world-class peak bites. Inshore, there are roosterfish, more than a dozen snapper species, grouper, jack, pompano… The Caribbean coast, especially to the north near Nicaragua, has a superb seasonal tarpon bite, along with snook and feisty, smaller freshwater game fish such as guapote (also know as rainbow bass), machaca and mojarra. Costa Rica also has some of the world’s top saltwater sportfishing charter captains. Among them are Bobby McGuinness, the IGFA world’s top captains in 2006 and 2010, and holder of 302 IGFA world records. He fishes out of Golfito on Costa Rica’s South Pacific coast. 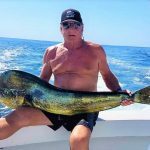 There is Bubba Carter out of Los Sueños Marina, a name that every sportfishing enthusiast knows. Los Sueños is Costa Rica’s best-known marina, and home to some of the world’s most prestigious billfish tournaments. The Los Sueños saga is a fascinating tale. Click here to read about it from its very beginning. Another legendary captain is Randy Wilson, who fished out of Tamarindo on Costa Rica’s North Pacific coast. Randy came to Costa Rica at the end of the 1970s. He pioneered catch-and-release, and fashioned his own circle hooks to reduce injury to the fish. On the Caribbeaan side there is Captain Eddie Brown, considered Costa Rica’s top tarpon fisherman/guide. 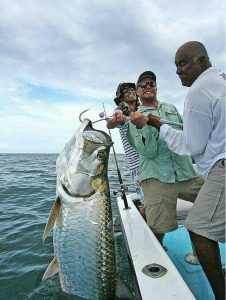 Eddie has spend 40 years guiding anglers to catch tarpon. Another plus is Costa Rica’s incredible weather. On the Pacific coast, you can fish basically the year round, even when it rains (from August through October). And finally, Costa Rica has all sorts of excellent, angler-friendly hotels in all of its prime sportfishing destinations, along with bars, boutiques, fine dining and a vibrant nightlife for those looking for after-fishing R&R. What else can one ask for: an incredible year-round array of gamefish, top captains, great weather, and terrific accommodation. It’s also easy to get around, and most people in the tourism and the Costa Rica sportfishing industry speak English. That’s why sportfishing on Costa Rica is on everyone’s lips. Contact us now and be a part of it. FishCostaRica will hook you up with Costa Rica’s top saltwater charter captains.